Revolutionary product design! The bowling ball spins while the shooting star graphics appear to move. This trophy sure to be a hit with anyone receiving it. 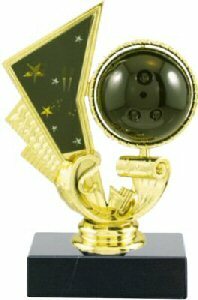 Black marble base, free imprinting on a gold plate is included with this trophy.